The products featured here currently are the most essential accessories for our registers. For any looseleaf register it is important to include for each account a looseleaf schedule of automatic transactions that you have pre-authorized to be charged against or deposited to your account (which, for credit card accounts would also include charges by the credit card provider, such as monthly interest and annual fees). These remind you of upcoming automatic transactions so that you can prepare for them in advance and not get blindsided by a surprise charge or debit. We have one format for automatic credit card transactions and a slightly different format for debit card/checking account transactions which adds a provision for automatic deposits. Our register booklets already have some provision for listing automatic charges (see those product pages), but if you have more than their capacity, you could use these looseleaf schedules to list more of your automatic transactions. 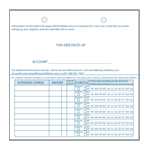 If you are tracking multiple accounts within a single checkbook cover, another essential accessory is our custom tab dividers so that you can readily access any register without confusion or frustration. We have one design for multiple credit card register booklets (which includes one tab divider for a debit card or other banking account) and another design for any type of account, but are especially provided for our looseleaf registers. In the future look out for other accessories such as "checkbook" covers (which are now no longer limited to just checking transactions! ), card holders, and wallets. Additionally we will be offering some storage products currently being developed to help you archive your completed registers.